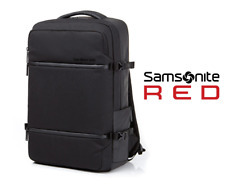 samsonite backpack laptop. Condition is Used. Shipped with USPS Priority Mail. • Weight: 2.9 lbs. • TSA Checkpoint-Friendly. Great travel companion to take on your daily ventures PerfectFit adjustable laptop system lets you fit laptops 17" and under. Black polyester construction with red accents gives your backpack a stylish look. Padded top handle and shoulder straps for easy carrying. SmartStrap technology allows you to slide over upright handles for easy mobility. Multiple pockets let you organize traveling items. Front pocket fits tablet and iPad, oversized pocket for over-the-ear headphones or sunglasses, adjustable divider, computer sleeve and side pockets. >The item is a Samsonite blue and gray backpack . >The item has multiple pockets on the front, insides, and sides for storage as pictured. >The item is preowned. In good condition. >Sold as is. You do not have to remove the laptop from the bag. The bag will not have other corporate logos only Samsonite logo. Need an umbrella?. we have that! We apologize for any inconvenience this may cause. and now for the fine print. We will do our best to work with you until you are satisfied. Perfect Fit System accommodates up to 17" laptop Dedicated pocket for headphones, sunglasses, etc. Material: 1680 Ballistic weave polyester Warranty: 3 Years. Modern Utility Double Shot. - Fits laptop size up to 15.6". If you don't like the item, or you have any kind a reason that you don't wont to keep the item. - Zippered pockets. HAWAII AND ALASKA. we will respond right away and work with you out. I really do appreciate it. Occasionally I do make mistakes and will do my best to help correct the situation. 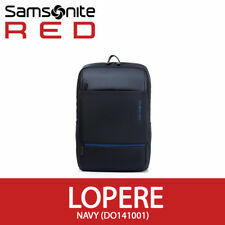 Samsonite - Laptop Backpack Black (1340). Condition is New. Shipped with USPS Priority Mail. • Large opening for easy access to contents. • Padded top handle for a comfortable carry option. Application/Usage: Notebook. Case Features: Accessory Pocket. Maximum Screen Size Supported: 17". Case Features: Padded Handle. Case Features: Tablet Pocket. Color: Black. Case Features: Side Pocket. Height: 18". Cord/accessory pouch included. Compact design. Application/Usage: Notebook. Perfect Fit adjustable laptop system. Smart sleeve. General Information. Application/Usage: iPad. Quick stash pocket. Stealth zippered water bottle pockets. Push-button locking ergonomic handle for comfort in transport. It's TSA checkpoint-friendly too, so you won't have to take out your laptop when going through airport security. You are looking at a previously owned Samsonite laptop backpack. Its in excellent condition, with very minimal wear. Lots of pockets to hold all your stuff. Large back open spot to hold a laptop as large as 17 inches! Nicely padded back and straps. This bag is the only go to travel bag you will need!. Product Line Tectonic 2. Manufacturer Samsonite. Smart sleeve allows the case to slide over upright handle tubes for easy transport. Plus, the padded top carry handle is perfect for traveling shorter distances. 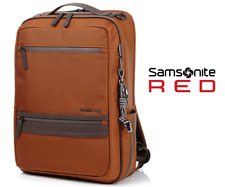 For sale is a new Samsonite Aramon NXT 17" laptop sleeve. These are checkpoint friendly, as the laptop can remain protected in the sleeve through airport security. Dual front zippered cargo pockets for organization can also accommodate a water bottle. Dual top carry handles with button closure handle wrap. Fully padded, adjustable shoulder strap. Color: Khaki. High tech shock absorber system for the ultimate protection of your laptop. 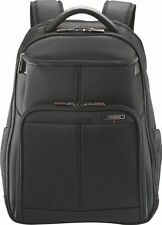 Up for sale today is a Samsonite Laptop Bag Backpack. I was given this as a gift and don’t have use for it. I was told it was new but without tags I can’t guarantee that. However it does look new, please view all pictures to verify. If more are needed please ask. Will be shipped USPS Priority Mail. Please ask all questions before committing to buy. Thanks! Large main opening for storage of cords, files, books, and clothes. Tablet/iPad Pocket. fit for 13 - 15.6 in. US only, no PO Box. cheaper if buy both. This bag is new without tags. Thanks for looking. SKU: 17896. We try to house over 5000 products. Weight: 4 lbs, 12 oz. Material: Rip Stop Nylon. Capacity: 2352 cu. • Padded back panel. The first has many small pockets for storage of pens and small objects (see photos). The second is just a smaller zippered pocket. Tablet pocket (fits up to a 10" tablet). Large opening and wide base provides stability when case is open. Fleece-lined accessory pocket. Padded top handle for a comfortable carry option. Ballistic Nylon, Genuine Leather / 17.5"L 12"H 7"W.
Tablet/iPad® pocket with tricot lining. DO NOT REMOVE SECURITY LABEL, it will void the warranty. Weight: 1.5 lbs. Padded removable shoulder strap. Country of Origin: Imported. Care: Wipe Clean. Base Material: 100% Polyester. CONSTRUCTED of rugged 1680 denier ballistic polyester for durability. TOP CARRY HANDLE features a micro injected top with neoprene padded grip. SMART SLEEVE feature allows case to slide over the Upright handle tube for easy transport. 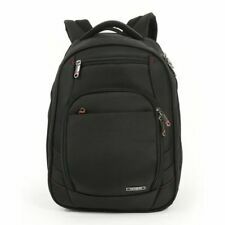 Samsonite Tectonic 2 Carrying Case (Backpack) 15.6" Notebook - Black - Shock Resistant Interior, Slip Resistant Shoulder Strap - Poly Ballistic, Tricot Interior - Shoulder Strap, Handle - 16.9" Height x 12.2" Width x 8.2" Depth Durable backpack is constructed of a strong, ballistic fabric with diamond ripstop accents to keep your belongings safely stored. Padded laptop compartment protects most 15.6" laptops from shocks while traveling. Smart sleeve allows the case to slide over upright handle tubes for easy transport. Brushed tricot sunglass pocket protects the frame and lenses of your eyewear from scuffs and scratches. Two quick-access storage pockets keep smaller items easily within reach. Dual-density shoulder straps are contoured to disburse weight more efficiently on your shoulders. Constructed of rugged 1680 Ballistic fabric for durability. • Adjustable laptop system (patent pending) provides a secure fit for 13 - 15.6 in. laptops. • TSA Checkpoint Friendly. • Soft neoprene touchpoint on carry handle. • Tablet/iPad Pocket. • Quick Stash pocket for last minute items. • Side mesh water bottle pockets. • Large main opening for storage of cords, files, books, and clothes. Also has a zippered mesh pocket for secure items. • Cool Flow back padding for comfort and breathability. • Weight: 2.205 lbs. Body Dimensions: 17.8" x 12.5" x 9.25"
Constructed of rip stop nylon that is resistant to tears and pulls. Has a padded laptop computer sleeve and a padded top carry handle. DONE - WE'LL TAKE IT FROM HERE! Expert Service. Unbeatable Price. ⚠ WARNING : Warning: This product can expose you to chemicals including Di (2-ethylhexyl) phthalate (DEHP), which is known to the State of California to cause cancer and birth defects or other reproductive harm.